Regression therapy helps the patient to relive forgotten or repressed experiences that contain unhealed emotional wounds that are triggering the symptoms. In hypnosis, the therapist taps into the power of the patient’s unconscious mind. Unlike the conscious mind that possesses an unreliable memory, the unconscious mind has a marvellous memory which registers even minor events and without our knowing it. At its core regression therapy is an advanced healing technique that leverages on the hypnotic state. It goes to the original cause of the problem and the memories buried deep in the mind are brought out. Unlocking and clearing those blocked emotions brings insights into how present complaints have their origin in often repressed and ignored experiences. This could be from life changing events in adulthood, or back to childhood, or pre birth. Traumatic childhood experiences that are repressed are a frequent source for such blocked emotions and processing these memories is also known as Inner Child Healing. Working with the subconscious mind allows new ways of understanding the problems by connecting with all parts of the self to gain inner wisdom, give the right meaning to past events, integrate all parts of the self and thus promote healing. Sometimes emerging experiences may seem like past lives. Regression therapists are open-minded and work with whatever experiences a patient has. The focus is not on offering explanations of past life phenomena nor promoting the doctrine of reincarnation. 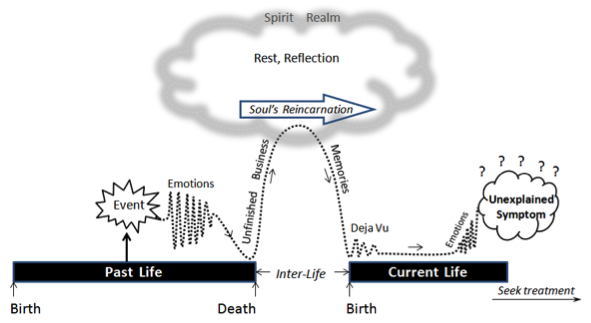 The believer of reincarnation would view the soul dwelling within the body at birth as having lived many lifetimes in many other bodies before. As a result of the actions in previous lives the karmic consequences manifest as a symptom in the current life. The Jungian analyst on the other hand would view the past life phenomenon through the concept of the collective unconscious, into which the individual is deemed to have the capacity to dip into the vast collective memory of mankind. Whichever perspective we take is unimportant. It is the ultimate analytic insights a client has emanating from the inner psyche during the regression process that is instrumental to healing. This makes this approach a form of Transpersonal psychotherapy. Possible stages working with regression therapy. Knowledge of how one’s past actions relate to the current life problem enables a reorganisation of the understanding of the issue at both the cognitive and the emotional level. The resulting change pervades the patient’s entire being and results in alterations in his outlook and lifestyle. Dynamic factors that have hitherto maintained the symptoms lose their influence and the end result is that of a transformation. Whatever has been disharmonious in the past is now rebalanced and a new equilibrium is established. The renewal restores the patient to wholeness and peacefulness via new beginnings. The patient is now able to make a fresh start because his hopes, dreams, and aspirations are revived. In explaining the concept of regression therapy, Roger Woolger used the analogy of old, corrupted program files that interfere with the running of a computer program. Problems at the psychic level such as depression, phobias and compulsive disorders are like corrupted files. They came from emotional patterns embedded from our past. Regression Therapy is like fixing these corrupted files to allow the program to function properly again. Many patients carry with them puzzling patterns of guilt, limiting thoughts and irrational fear in their lives. The psychiatric practitioner, unable to pinpoint the origin of these issues, may tend to label such problems as a general anxiety disorder. Yet from the viewpoint of regression therapy, such symptoms are not surprising because we recognise that they may have originated from an experience below conscious awareness. When we look for the trauma or event that has caused the psychological disturbance in the wrong place, the treatment just doesn’t work. Regression Therapy aims to resolve the problem by using the client's subconscious mind to find the source of the problem and the underlying message, put them into perspective, integrate and transform them, and thus promote healing. For more insight into the challenges and rewards using Regression Therapy follow this link. What is Regression Therapy A video produced by EARTh of how regression therapy can help people. It has comments from many of the pioneers of regression therapy.